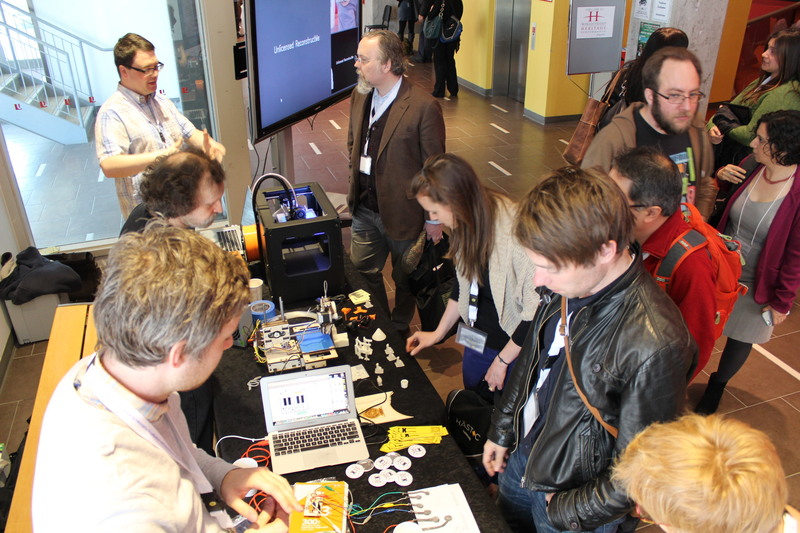 The Maker Lab team has recently returned from HASTAC 2013, the first HASTAC conference in Canada. 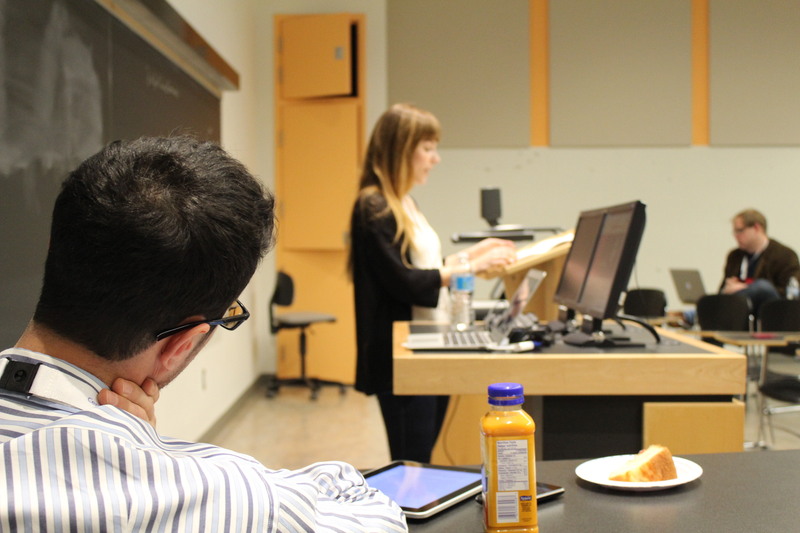 The conference was at York University, the Lab acted as a sponsor, and we had a blast! 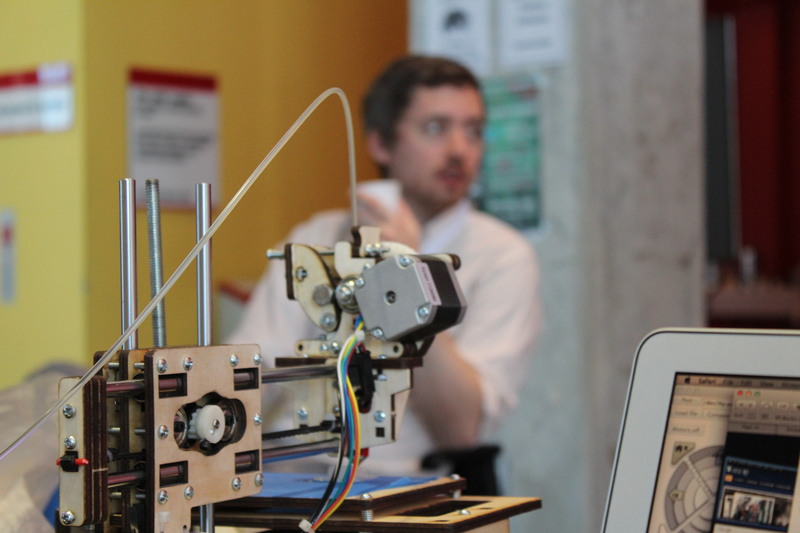 Below are abstracts for the papers we gave as well as a description of the popup makerspace we co-organized with the Ontario Augmented Reality Network (OARN) and Western University’s Lab for Humanistic Fabrication. 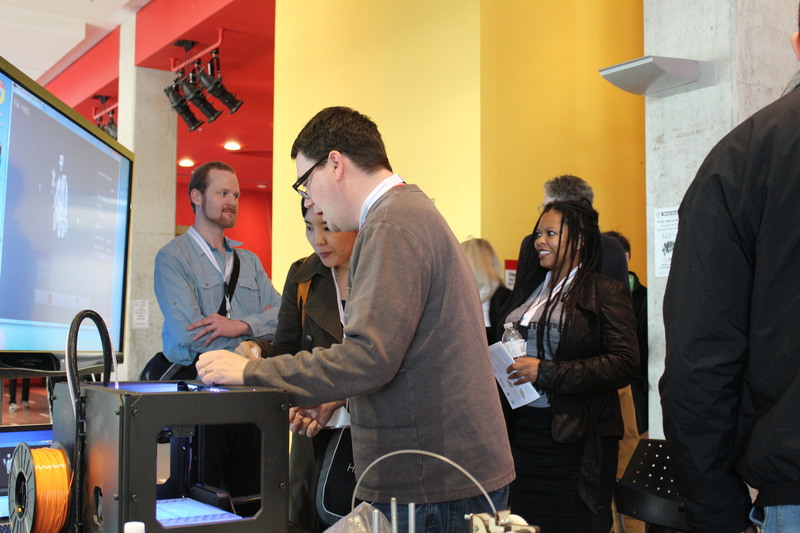 Also be sure to check out Kevin Kee’s OARN post, “How to Create an AR Makerspace,” which was written especially for HASTAC 2013. Thank you to the Modernist Versions Project (MVP), Implementing New Knowledge Environments (INKE), and the Social Sciences and Humanities Research Council (SSHRC) for supporting our participation in the conference. Maureen Engel and Caitlin Fisher did a wonderful job as conference organizers. Abstract: Exploring the intersections of and tensions between augmented reality and desktop fabrication, the space will be outfitted with various tools and equipment, including 3D printers, microcontrollers, Kinects, webcams, sensors, actuators, hand tools, and other resources for making. Participants will contribute their unique perspectives and expertise toward experimentation with desktop fabrication and augmented reality, broadly construed. The makerspace will provide the infrastructure and time for that creative collaboration, and it will bring together scholars, artists, and technologists who are already involved in maker communities. It will also be a place for others to experience maker culture and explore ways that they might apply maker-based approaches to their own work. Questions explored by the makerspace include: In what ways can augmented reality be materialized through fabrication techniques? What types of things do we want our realities to be augmented with? And how should our realities change, under what assumptions, and to what effects? 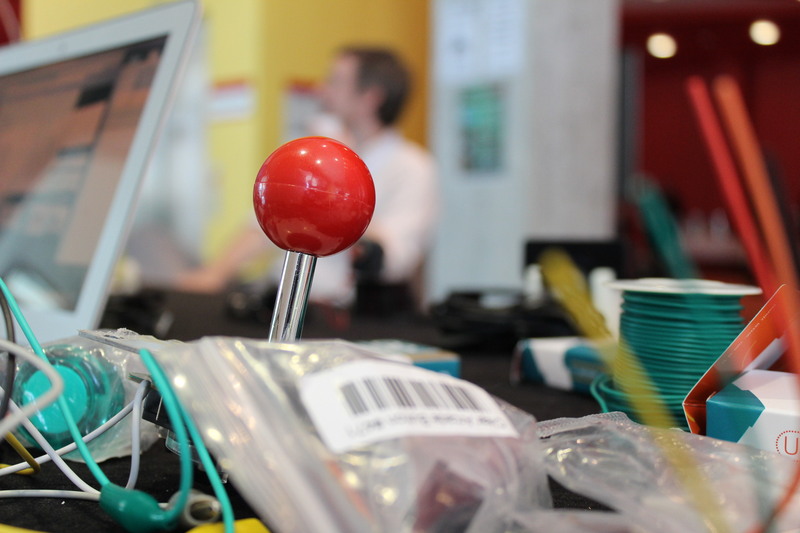 In principle and design, the makerspace will be very similar to the hackathon format: provide a space with tools and resources to create toward a common theme, and the results are often productive and surprising. Abstract: Digital scholarly communications are increasingly dynamic, collaboratively-­produced texts that emphasize interlinkages across unique, distributed resources. The now popular Resource Description Framework (RDF) offers considerable potential for supporting these aspects of digital scholarly production through the creation, publication, and harvesting of public RDF in the form of Linked Data. However, RDF and Linked Data have been mobilized largely in the sciences, and very little humanities research has been conducted on either. As such, this INKE paper asks what the humanities have to learn from RDF and Linked Data, and—more specifically—how each may allow scholars to explore “the kinds of humanistic phenomena” that “appear only at scale” (Liu 2012). This paper surveys an array of existing humanities projects involving RDF, organizing them into the following categories: 1) domain-­centric projects, which build upon previously established preservation projects and extend them online; 2) aggregator projects, which gather contextual information from disparate sites around the web and afford access to millions of scholarly materials, often through advanced visualization techniques; and 3) tools, which leverage the synergistic integrations promised by the growth of semantic web activities in the humanities and help scholars navigate, describe, and interpret large sums of data. Based on this survey, the INKE Research Team has concluded that humanities applications of RDF and Linked Data generally differ from those in the sciences. Whereas science-­based applications tend to privilege a single structure or ontology, humanities applications focus on user-­based knowledge creation and customized ontologies and approaches. Yet this conclusion also acts as a cautionary tale for the future of RDF and Linked Data in humanities projects, namely because customized ontologies and approaches pose a number of difficulties where accessibility and interoperability are concerned. Transparency of knowledge representation and ease of use will have a major influence on how effectively Linked Data will help humanities scholars explore phenomena that appear only at scale. As such, this paper ultimately recommends that digital humanities practitioners consider the “long now” of their RDF and Linked Data projects (Eno 2003). A form of long-­term thinking and responsibility, working in the long now involves designing, building, and maintaining domain-­centric collections, aggregation projects, and tools that think seriously about the audiences, developers, and archivists who are well off in the distance, in 2023 and beyond. Abstract: During the last few years, the integration of games into learning processes has been the subject of significant and often heated debate. From Ian Bogost’s quibbles with “gamification” to the widely popular “Badges for Lifelong Learning” competition, the challenge remains: how do we build gaming environments that encourage self­‐reflexivity and meta‐critical awareness? In response to this challenge, members of INKE (inke.ca)’s Modelling & Prototyping team are developing ways to “game” digital scholarly editions, with an emphasis on helping new editors learn more about the processes of scholarly editing. The team’s research is motivated by the assumption that scholarly editors can and often do act as game players, whose conditions of possibility afford a small degree of flexibility. Working within these conditions allows both editors and game players to acutely attend to the parameters, procedures, and workarounds that shape decision-­‐making. Gaming the edition thus involves foregrounding the overlaps between gaming and editing, and then—in the case of INKE’s working model—constructing an environment where new editors develop competencies through play, collaboration, and shared tacit knowledge (i.e., learning by doing). This paper will not only unpack the INKE team’s framework for play, collaboration, and shared tacit knowledge in digital editing environments; it will also deliver its model for gaming the edition (including schematic diagrams). Among other game-­‐like features, the model underscores the importance of challenge, reward, procedural rhetoric, and non-­‐linear, dynamic narratives in the future of scholarly editing. Although the team has not yet built the prototype, we will show audiences why it is needed now. Abstract: The TEI (Textual Encoding Initiative) guidelines ensure that the academic community remains consistent in their methods for encoding texts. However, as a tool constructed, implemented, and used extensively by scholars in the digital humanities, we must critically examine the TEI for how it may implicitly dis-content issues of gender and marginalized groups. Through an exploration of two digital encoding projects, this paper argues that TEI potentially dis-contents texts in two ways:  by excluding certain characters and spaces as viable data; and  by structurally privileging empirical data sets over interpretive ones. Building on the body of work by Wendy Chun, Tara McPherson, and Alan Liu, who all investigate the ways digital tools and spaces (under)represent marginalized groups, as well as Desmond Schmidt’s critique of TEI as an effective markup language, we argue that while strategies exist within the TEI to represent these marginalized characters and their spaces, the TEI structure fails to adequately privilege these strategies and thus re-inscribes both the racial and gendered hierarchies already at work within certain texts. What we recommend is a more self-reflexive use of TEI in combination with procedural transparency and a community that enables ongoing dialogue about best-practices in order to remind humanities scholars that the violent fixity imposed by markup is untenable in literary critical analysis. Such use will challenge the assumption that our tools are ideologically neutral and force us to examine the cultural, political, and technical forces affecting literary production online. Abstract: My talk argues that the future of digital literary analysis lies not in solving apparent interpretive cruxes, but rather (if you will forgive the awkwardness of the construction) in exploring the cruxishness of these cruxes. It’s about using digital resources to “problematize” literature—or simply to elucidate (qualitatively and quantitatively) how problematic it already is. My talk will begin with some familiar statements about the perceived cultural split between humanities approaches (which value problems, cruxes, irresolvable quandaries) and scientific approaches (which seek solution, resolution, and definite answers). I’ll next focus on two projects I’m currently leading, both of which are aimed at demonstrating the “problematic” nature of particular modernist literary texts—and also in engaging reading in the active exploration of their mysteries. The first is He Do the Police in Different Voices (hedothepolice.org), a website I developed collaboratively with Computational Linguist Julian Brooke and the 200 students of the Fall 2011 section of “The Digital Text,” the course I teach at the University of Toronto. The site provides users with resources for exploring the “dialogism” or multi- voicedness of T. S. Eliot’s The Waste Land, the working title for which was “He Do the Police in Different Voices.” I will next look at The Brown Stocking, an ongoing project I am producing with Julian and the 320 students enrolled in this year’s sections of “The Digital Text.” The aim of this project is to develop a quantitative measure for describing novelistic “dialogism.” Its starting point is a richly-annotated TEI edition of Virginia Woolf ’s To the Lighthouse, tagged by my students for direct, indirect, and free indirect discourse. The aim of this project is to see whether, by using techniques of machine learning, we can develop an algorithm that can automatically detect free indirect discourse—instances where it simply doesn’t know who is speaking. We’re interested in seeing if we can teach an algorithm to behave like a reader of modernist literature, and learn to accept uncertainty. Post by Jentery Sayers, attached to the HASTAC, ModVers, and Makerspace projects, with the news, fabrication, versioning, and phys comp tags. All featured images for this post images by Jentery Sayers, taken at HASTAC 2013. Image 1 of the “Made Realities” makerspace, Image 2 of Alex Christie and Nina Belojevic, Image 3 of Shaun Macpherson, and Image 4 of Devon Elliott, Simone Browne, and others.